We have entered a new year with the commencement of 2017. Looking back, the beginning of last year saw the resignation of Okajima-sensei from his role as my successor, and many dojos from Europe and Australia left the organisation through the year. In Okajima-sensei’s case, he decided not to succeed me for personal reasons and he is still a member of the organisation. 99% of the people who train in aikido do so as a way of fighting or a form of jujutsu, and instructors teach it in this way. This is why people end up thinking that aikido is all about coming up with ideas for how to throw or pin someone who attacks them. Actually, even I thought this way in the past. Now, I am 80 years old, and what I have discovered through my own research and reflecting on my memories of O-sensei is that O-sensei did not think in this way at all. 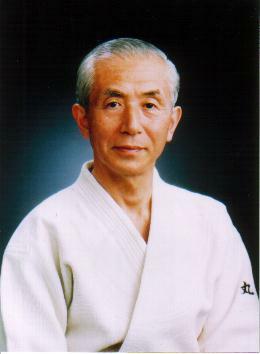 I now understand that O-sensei wanted to teach people a way to live their lives through aikido. When I travel to overseas dojos, I often see an explanation of the meaning of aikido on the wall, which goes like this: “合 (ai) = meet,” “氣 (ki) = universal energy,” and “道 (do) = way.” This is totally wrong. In Japanese, “to meet” is written with the character “会.” “合” means to become one with something, or “oneness.” This is why the word “会合 (kaigo)” means to meet each other and come together as one. “氣 (ki)” means exactly what everyone thinks it means. Therefore, “合氣 (aiki)” means to take the energy of the universe into your body, to become one with it, and to use it. The character “道 (do)” comes from China, and it was originally read as “michi” in Japanese. The two syllables in “michi” can be equated to the characters “身 (body)” and “血 (blood).” A “body” often refers to a corpse. The original reason for reading “道” as “michi” is because it indicates how a human being is able to live. In places where people don’t live, there are no “michi” (roads or tracks), although animals make animal tracks when they search for the necessary items for their survival. Anyway, “道 (michi)” tells us how we should live as a person. So, in short, “aikido” means to take the energy of the universe into your body, become one with it, and figure out how to live your life as a human being. Many years ago, a man named Abe-no-Seimei created a belief system called Onmyodo. This system also taught people to use the ki of heaven and earth to live correctly and peacefully. However, if a person holds a grudge or attacks someone else, their odo (ki) instantly turns black and threatens the other person. This is known as “kegare (impurity).” Kegare is written as “汚れ”; however, the characters, “氣枯れ,” which means “withering ki” can also be used. This is because what originally had a beautiful colour has withered away. The “true aikido” that O-sensei taught was a way of getting rid of this “impure” ki and filling up with true beautiful ki. In order to take in fresh and beautiful odo, it is necessary to have an extremely high level of integration of body and mind. It is not something that can be achieved overnight. Furthermore, if you focus on throwing or hurting the other person, your odo will become jet black and your training becomes a fight between two people who are equally stupid. From the perspective of a high-level practitioner of Onmyodo, I’m sure that it would look like a raging storm of jet black odo. As the person who had the privilege of hearing O-sensei’s last words, I would like to bequeath “true aikido” to the world while I am still alive. It doesn’t matter what I say to those who won’t understand and prefer jet black, malicious odo, because it won’t sink in. This year, it is my aim to only focus on teaching those who seek to learn true aikido, irrespective of how many people decide to leave. Luckily, I have many students in Japan, who are devoted to understanding “true aikido” and spreading it to others, including Katsuaki Motegi, whom I have appointed my successor, as well as Peter Kelly from Australia and Martijn Van Hemmen from the Netherlands, whom I have appointed global instructors. I believe that this year will be a year in which the odo (ki) of Aikido Yuishinkai glows a beautiful rose colour.